Roasted Lemon-Garlic Chicken with Potatoes-I loved the uncomplicated flavor combination. It was not hard to make, but it was not a quick week night meal, for sure. Chicken with Balsamic Vinegar Glaze-I’ll admit this one was not my favorite, the soy sauce in the glaze overpowers the balsamic flavor so the glaze tastes more like a teriyaki sauce, which isn’t bad but not quite what I was looking for. Pork Tenderloin with Creamy Mushroom Sauce-Did I mention I’m living in pork country? Which means I am fixing and eating pork at least twice a week and to be honest I’m not sick of it yet. This was great, for the creamy mushroom sauce, I used plain greek yogurt instead of creme fraiche or sour cream just because that was what I had on hand. Mac & Cheese-I cannot rave about this recipe enough! I absolutely loved this lightened up mac & cheese. The most surprising part, is that instead of making a complicated or tricky cheese sauce the creamy texture is made from cooked squash that has been purreed. I know that sounds kind of funky, but take it from someone who does not like squash–this mac and cheese was excellent and tasted nothing like squash! Crispy Pork Medallions-This was super easy to make, essentially the pork is sliced, coated in mustard and bread crumb before it is cooked. The pork was moist on the inside and crispy on the outside–perfect. Chicken and Chorizo Stew-This hearty stew had a great flavor to it. The only problem…I could not actually find Chorizo. Apparently that’s not a common item in Charleston, I settled on using a chicken sausage, which was good, but I would love to try making this again with Chorizo. Chicken Breasts stuffed with Sun-Dried Tomatoes and Goat Cheese-What I liked about this particular recipe was the combination of several different bold flavors, the goat cheese, sun dried tomatoes, and a decent portion of fresh basil. Pork Tenderloin stuffed with Blue Cheese and Pear-Now this one, this one gave me some sass. And by sass I mean I messed up the proportions when I decided to half the recipe. The result was salty and unbalanced flavors, however I do love the combination of pears, blue cheese, and pork so I want to try this recipe again and try to get it right, and perhaps use a milder blue cheese. Eggs Poached in Tomato Sauce with Onions and Peppers-I tried this recipe the other day for lunch, and I really loved it. This is a great way to jazz up some eggs to make a more substantial lunch or dinner out of them. Shrimp Tacos with Green Apple Salsa– This is a low maintenance dish that does not take long to make. I used whole wheat tortillas instead of corn, and after toasting them I put them inside of a tall cup while still hot so as they cooled they held the shape of a crunchy taco. Roasted Moroccan Spiced Grapes and Chicken-My favorite of the month. I love the spices used on the chicken thighs and the bold flavor of the roasted grapes. Chicken sautéed with Apples–ok, I did not actually get to making this chicken recipe this month, but it’s been on my meal list for a couple of weeks now. I made it this past fall and really enjoyed it, so I decided to share it anyway. Guinness Cupcakes-This month I made my Guinness cupcakes for St. Patrick’s Day, and as usual I was very pleased with the flavor and moistness of the cupcakes. Filled Cupcakes with new White Cake recipe-This was a fun post, I really enjoyed doing a technique oriented post and trying out a new cake recipe at the same time. Home Made Pop Tarts-I did not post about this, but I’ve made this recipe twice this month. Seriously, the flakey, buttery dough is out of this world! The recipe is from the Flour cookbook by Joanne Chang. I love this cookbook! I want to make everything in it, if you’re looking for an excellent baking cookbook, this one is a must have. Next on my list from this book; home-made donuts. Lemon Cake with Black Tea Frosting-I have not posted this one yet, but this post will be coming soon. I tried this recipe about a month ago, but I’ve got some changes to make before posting. Stay tuned. On that note, if anyone has any thing they would like me to write about, just let me know. Are there any baking or cooking techniques you would like to see done more closely, or any recipes they would like to see posted? One more thing to share; something very exciting happened this month, so exciting I can’t believe I waited until the bottom of this post to mention it. 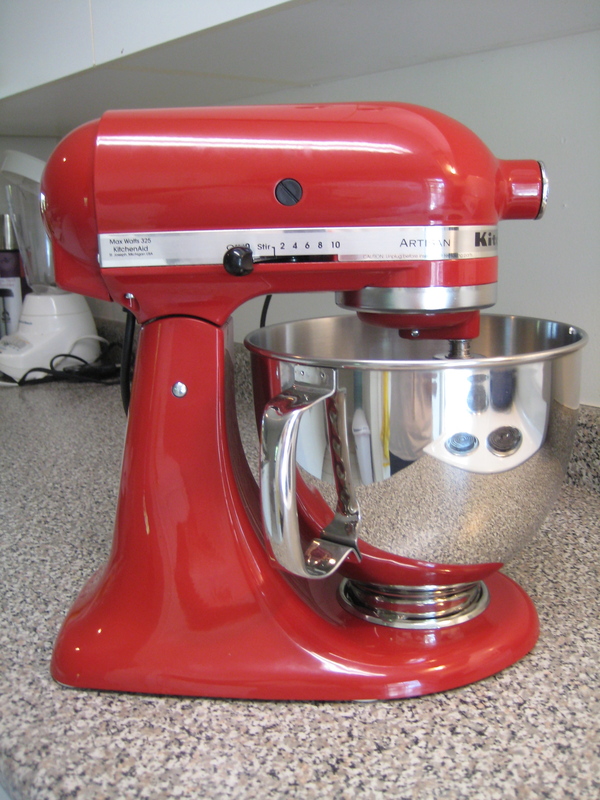 Someone very awesome and amazing bought me a beautiful, shiny, red, brand new Kitchen Aid!! It’s so pretty, and of course, works wonderfully. I am so thankful and lucky to have it! I’m looking forward to trying some new bread doughs and perhaps some new cookie recipes with my new Kitchen Aid.